Ryogen Ryu™ Heiho Bugei represents – the Phoenix bird – of the Ryogen Ryu™ school and was created on soke Hayashi’s foundation school, this being a sequel of the Phoenix bird by connecting it through soke Ono Takashi. Ryogen Ryu™ Heiho Bugei has this title in order to differ from the originary school which existed in the past in Japan when Ryogen Ryu™ was known as Ryogen Ryu™ Kendo (Ryogen Ryu™ Heiho Kenjutsu). The new concept (Shinden) Ryogen Ryu™ Heiho Bugei combines the old warrior tradition (Koden) Ryogen Ryu™ Kendo by the contribution of soke Ono, with new elements proposed by shihan Ozon. Ryogen Ryu™ Heiho Bugei has another organizing system, which differs from the originary form in which there was only a title of soke and menkyo, and Kyu-dan system did not exist. In the Ryogen Ryu™ Heiho Bugei the ranks are attributed in the Japanese modern system Kyu-Dan; for kyu in decreasing order 6-1 Kyu, for dan in increasing order 1-5 dan (maximum level). Between Kyu and dan there is the shodan-ho rank or aspiring black belt (shodan), but also in the traditional Japanese system by using the menkyo for each level: Shokyu, Chukyu, Jokyu, Shoden, Chuden, Okuden, Kaiden. Ryogen Ryu™ Heiho Bugei consists of two parts: omote and ura. 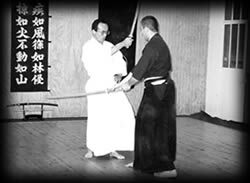 Iaikenpo – combat method using a Japanese sword which combines elements of iaido – iaijutsu and kendo - kenjutsu. Shinobi Bujutsu – combat method using secret, concealed weapons (kakushi buki waza) the art of samurai and ninja warriors as well (ninpo-ninjutsu). If you come to me, I will welcome you. If you want to leave, you are free to leave. As we meet, we harmonize. Ten means five plus five. Ten means two plus eight. Ten means one plus nine. Harmonized like this, we can see lies and truths behind the soul. The sea can break everything and in the sand nothing can be hidden. Life and death are only a moment in time. Time can wait but time can also change. When you are confronted with anything, act without hesitation.